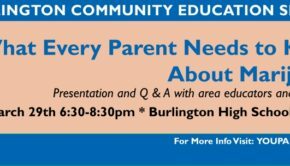 If you haven’t had a conversation with your child about drinking and drug use yet there is no time like right now! Or you can look for what people sometimes refer to as “teachable moments”. A teachable moment is an unplanned opportunity that makes an issue more relevant for a child because it can be related to a current situation; something in the news, an advertisement on TV, something happening in school. Using that moment when a child is directly relating to that situation can be extremely effective. It helps them to grasp the concept in a real situation in real time, rather than during an abstract conversation. Repetition is also important. Talk early and often. April is National Alcohol Awareness Month—use this month to do something to support or recognize people struggling with the disease of alcoholism. Make a pledge as a family to join in the national Alcohol Free Weekend on April 5-7th and remove all alcohol from your home for these three days. 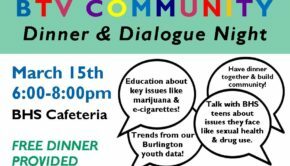 April 25th is Prevention Day at the VT Statehouse—join other Vermonters from 10-2pm to support substance abuse prevention initiatives in VT. When you see an advertisement for alcohol on TV or in a magazine or hear one on the radio, while with your teen. The human brain is not fully developed until the mid-20’s, which helps explain why teens are more prone to engage in risky behaviors. This means that teens and adults do not think the same way. Adults make decisions using the frontal cortex region of the brain, the part that controls rational functions. The frontal cortex of a teen’s brain is not yet developed. In fact, it is the last part of the brain to develop. Teens rely most heavily on the back part of their brains, which controls instinctual and emotional functions. This helps explain why teens often act impulsively and with strong emotions. 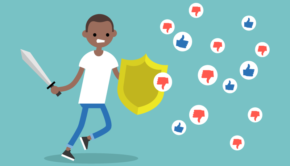 It is important to let your teens know that you respect and love them, and because their brain is still developing you will support them by setting expectations and rules to help enforce healthy behavior. In adolescence and young adult life, there is a “pruning phase” whereby as much as 50% of the neural connections in some regions of the brain are lost. We create neural pathways by using certain parts of the brain-those that get used the most grow stronger, while those connections that don’t get used grow weaker and die off. Why does this matter? Because risky behavior during adolescence can create unhealthy neural responses that last a lifetime – for example, becoming dependent on alcohol or drugs to deal with stress or to alter mood. Children who begin drinking alcohol before the age of 15 are 5 times more likely than those who start after 21 to develop alcohol related problems. 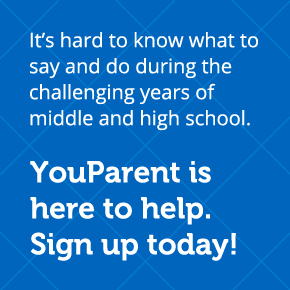 If you are worried your teen is struggling with healthy decision making or want to learn more about how to support your developing child and prepare for their high school years, our new support system through YouParent for Burlington middle school parents and caregivers can help. YouParent Tip: Set Clear Expectations & Hold Your Ground – And just so you know “everyone else’s parents” are NOT letting them [insert forbidden behavior]! 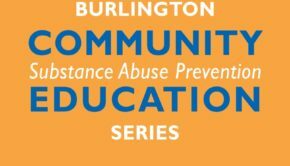 72% of Burlington teens in grades 9-12 report they did not drink in the past 30 days (based on 2011 Burlington School District Youth Risk Behavior Survey data). Your opinion, values and behavior do matter – so make sure your kids know where you stand!